Networking with colleagues is important, especially when studying wide-ranging, migratory raptors like Turkey Vultures. The species has a distributional range of more than 26 million square kilometers (i.e., about 8 million square miles) that stretches from Canada in the north to southernmost Argentina and Chile in the south, and individual vultures can be in my Pennsylvania backyard one day and in central Florida two weeks later. Or, in the case of my Canadian colleague Wayne Nelson’s wing-tagged nestling “ANL-yellow,” at a nest in southeastern Alberta in mid-August 2012 and at a zoo in northern Venezuela in mid-January 2013. 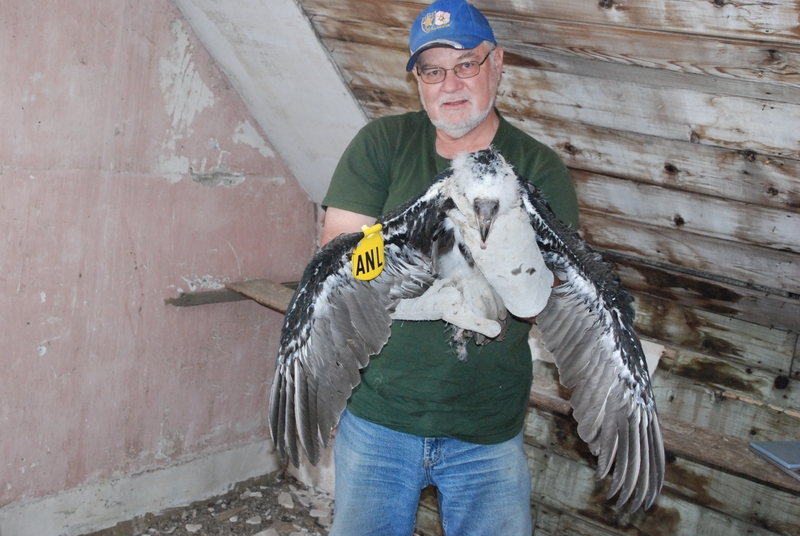 Wayne Nelson took the photo of the bird being held by his colleague Dave Moore at the nest site in Alberta. We don’t get many reports of wing-tagged Turkey Vultures south of the United States, which is one of the reasons we like to wing tag the long distance migrants that breed in the American West on their wintering grounds in northern South America and then use the strength of the community of American and Canadian birdwatchers to help us re-sight them on their breeding grounds in North America. But two of our Canadian colleagues, Wayne Nelson (in Alberta) and Stuart Houston (in Saskatchewan), wing-tag vultures breeding in the prairies of western Canada, and we are happy that they do. Stuart Houston uses dark-green wing tags with white alpha-numerics, and about ten years ago one of his birds was seen overwintering at the Maracaibo Zoo in northwestern Venezuela. Wayne Nelson, by comparison, uses yellow wing-tags with black lettering. Sure enough, last week we received a second report of a wing-tagged Canadian vulture, and this time it was one of Wayne’s (“ANL-yellow). In both cases the person responsible for reporting the vulture to us was Adrian Naveda, a former international trainee at Hawk Mountain Sanctuary from Maracay, Venezuela. 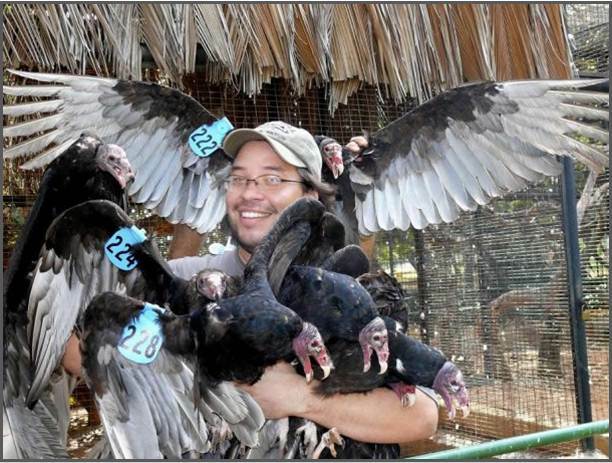 Over the years Adrian has developed a reputation as the “vulture guy” in Venezuela’s ornithological and conservation communities for his work on Turkey and Black Vultures there, where he and I are collaborating on several projects. Although Adrian is currently studying for his Master’s degree in Ecuador, Dr. Carlos Silva (from Barquisimeto Zoo) and Dr. Mariaisabel Santana at the Paraguana Zoo, which is where the (unfortunately) injured bird was brought, immediately contacted him about the bird. Adrian then contacted me and our Canadian colleagues to alert them of this most recent “re-sighting.” The vulture in question had been rescued by a Venezuelan petroleum worker in Amuay near an oil refinery on the Paraguana Peninsula north of the coastal city of Coro in Falcon State. The bird, which could not fly, had a broken wing. According to the vets who examined it, the break was an old injury that had healed over, rendering it permanently flightless. How the vulture broke its wing is not known, but flying into electrical transmission lines is something that Turkey Vultures often do, especially when they are flying with the head pointed down looking for carrion. Vultures are particularly vulnerable at such times because flying with their head pointed down creates a huge blind spot in the direction of their path of travel. Or to put it simply, they are not looking where they are going. Wing tagged vulture at the zoo in Venezuela by Mariaisabel Santana. How long the bird had been walking around scavenging for carrion is not known. 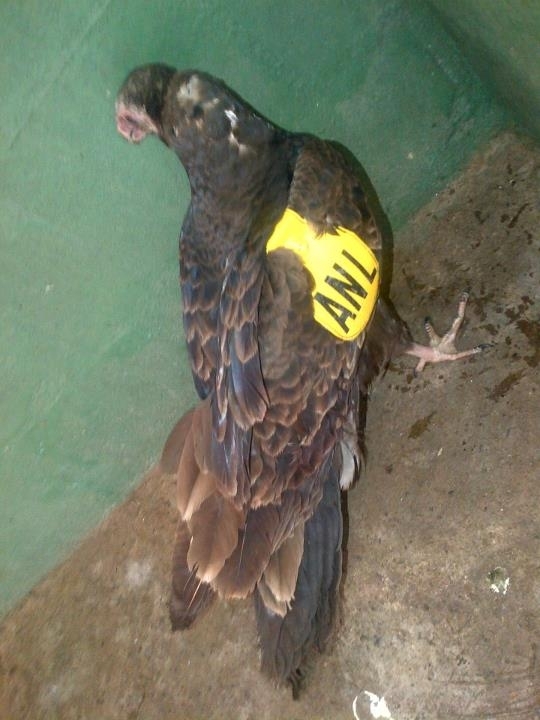 Most vultures from Canada arrive in Venezuela in late November or early December, and “ANL-yellow” may have injured itself more than a month ago. 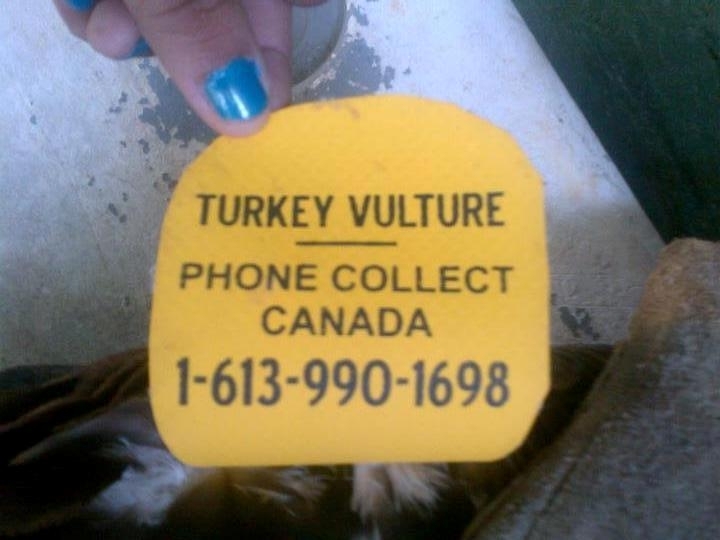 One thing is certain, it won’t be returning to its Canadian breeding grounds. Whether or not the bird will be euthanized or live out its life at the zoo in Paraguana, has yet to be determined. Although we know that the first year of life is tough on most raptors, including vultures, specific information regarding how they meet their demise is an all-too-rare commodity among conservationists. And ANL-yellow offers information that is yet another piece in the puzzle. Hawk Mountain managed to get this rare gem because Mariaisabel, Carlos, Adrian, Wayne, Stuart, the vet at the Paraguana zoo, and others like them, keep in touch with each other, as well as with us. Networking among conservationists is critical and, for that matter, so is the general public, including the petroleum worker who turned the bird over to the zoo. Next week I leave for 18 days of field work on vultures and caracaras in the Falkland Islands. Expect more entries soon.